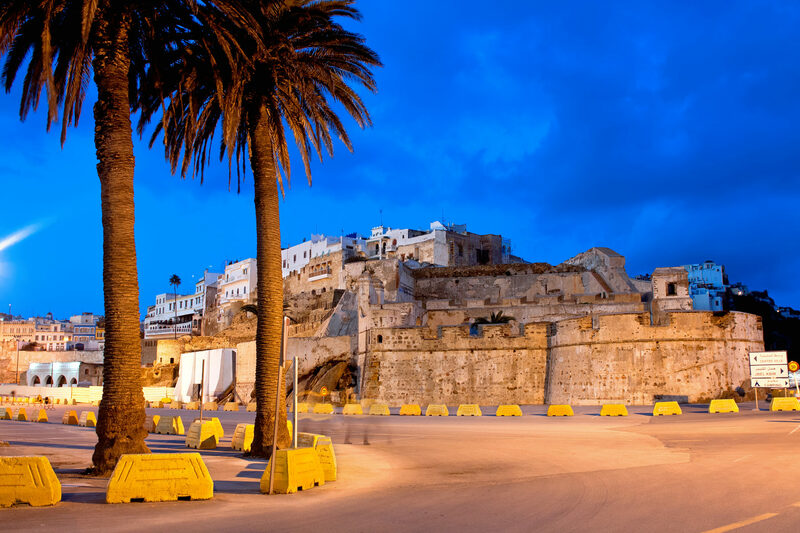 Tangier is a ancient Moroccan port city lying on the southern shore of the Straits of Gibraltar. It has been a gateway between Africa and Europe since Phoenician times and offers visitors a sense of exotic mystery, interesting history, beautiful vistas and unspoiled beaches. This small but famous church is a popular tourist attraction, the Lord's prayer behind the altar is written in Arabic and amongst the two hundred tombstones there are famous names that have been laid to rest in this graveyard. The entrance to Dar el-Makhzen is an impressive site with its imposing brass doors, take a close look at the brass knockers, made by artisans from Fez el-Bali. Fez's Royal Palace and gardens are closed to the public. This former sultan's palace now home to the Kasbah Museum focuses on the history of Morocco from prehistoric times to the 19th century including Mosaic floors, carpets, jewellery and finely crafted ceramics. The old city, or "Medina," of Tangier is a maze of narrow streets on the hillside above the harbour. Take a stroll through the medina and explore all the shops and stalls selling Berber carpets, ceramics and various antiques.